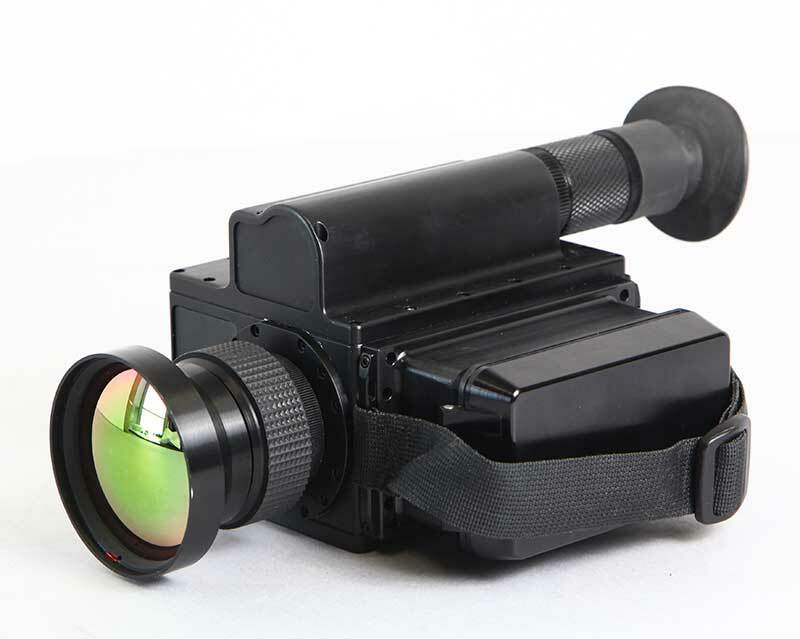 The Inframetrics Milcam XP is a military style handheld IR imager that weighs les than 5lbs for comfortable forward surveillance, training or target monitoring. Its cooled thermal core provides high resolution long range thermal reconnaissance footage with a human detection range over 5 meters. Though the product is discontinued, its ability to detect targets through fog, smoke, dust, debris & even total darkness made it an obvious choice for US military operators on foreign combat missions and US domestic security forces. The Milcam XP features a 256 x 256 FPA 3.4 to 5.1 µm pixel cooled thermal detector (PtSi or Platinum Silicide) that produces SWIR long range capability in a small form system. In addition, the 3.4 to 5.1 µm wavelength can even see through some types of glass, a feature not capable with other thermal imaging camera systems. The standard Germanium lens offers 8.0º horizontal x 7.0º vertical field of view, and adjustment options include brightness, contrast, polarity, low battery, reticle on & NUC. This Inframetrics Milcam XP is a used thermal imager and is in good condition, but is being sold AS IS with no warranties, exchanges or returns offered. All sales are final. The unit has been powered on & verified to be in working condition. The unit runs well, the eyepiece and the menus also function properly. There is, however, an issue with the video out cable, but other than that it works fantastically. Kit contains: Milcam XP used thermal imager, 2 batteries, comfort strap, rubber eyepiece, system keys, video out cable, battery charger, hard case & user manual. System dimensions: 8.25″ x 3.75″ x 4.0″ Weighs under 5lb.